There are many ways to control the volume of your presets in Absynth and many options are not on the same page. This being the case, I offer you a few tips with screen shots to help you wrap your head around overall volume adjustment technique in Absynth. First off, you can control the volume of each of the channels in the preset using the volume sliders ate the bottom of each channel while designing your sound. When you have finished your sound, go to the “Perform” page. Then adjust “dB” value to set the overall volume of the preset relative to other presets in your library. This setting is also handy a handy way to change the volume of presets in factory or third party library that are too loud or too soft for your taste. 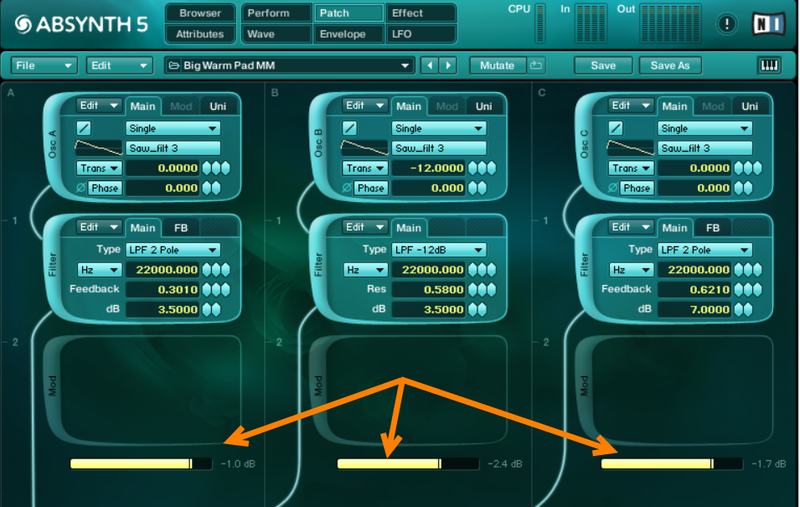 You can also have Absynth automatically ajust the levels so that the sum of the tree audio signals of channels never exceeds 0 db. 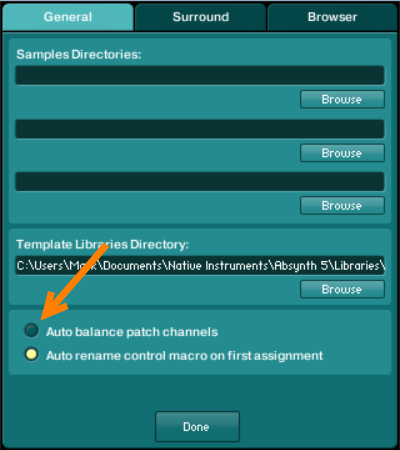 To set this go to “File”>”Options”>”Genera” then select “Auto balance patch channels. I only use this last method when I’m designing sounds that might have crazy volume or pitch transients to protect my ears and speakers. Once I’m satisfied with the overall patch, I turn this off and manually tune the volume per the “Controlling Channel Volume” section above to achieve more dynamic sounds.